Search Results for "filing cabinet"
Candid video footage of a smartly dressed female office worker opening a filing cabinet drawer to retrieve a folder. Video footage of an anonymous smartly dressed male office worker opening a filing cabinet to retrieve a file before closing the drawer and exiting the scene. 1974 - Agents are shown driving and working in the J. Edgar Hoover Building in Washington, D.C. and trainees graduate from the Federal Bureau of Investigation Academy in Quantico, Virginia. 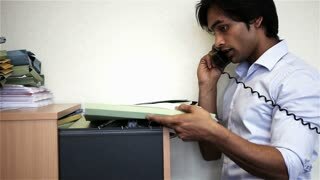 Candid video footage of an Indian business professional dealing with a phone call while referring to his notes from a filing cabinet. UNITED STATES 1970s: Man in Hard Hat Enters Office as Colleague Speaks with him. Man in Hard Hat Sits on Desk and Nods Head. 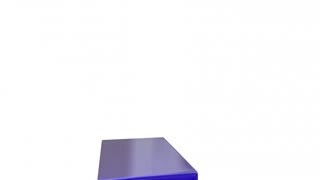 Man Picks up File from Top of Filing Cabinet. Man Sits at Office Desk and Writes. 1970s: Bureau of Employment Security. A young woman speaks with a man at a desk. 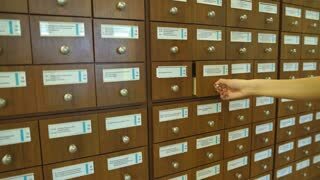 A man looks through a filing cabinet. Espionage agents open a combination lock on a filing cabinet and photograph files as a guard makes his rounds at a technology company. 1960s: Animation. Punch-typed paper tape is fed into a computer and magnetic tape comes out the other side. A reel of magnetic tape spins, absorbing an entire filing cabinet. 1960s: Animation. Hands adjust graphs on "furniture chart." Man opens filing cabinet and paper flies out. He looks surprised. Paper lands on woman's desk. Waste paper mesh bin with crushed paper thrown in. Home office with filing cabinet in background. Full waste paper mesh bin with crushed paper throw failed attempt. Filing cabinet in background home office. 1950s: Drawing of speeding report going into Motor Vehicle Department filing cabinet. Chart: "Uniform traffic ticket, Violations bureau, Traffic court school." People in courtroom. United States map. 1950s: Man and women sit at office desk and converse. Man folds arms on desk and speaks. 1960s: Woman files papers on table and looks at wall. Wall clock. Woman looks back to table and continues filing. Man with glasses enters room and speaks to woman. 1960s: Man with glasses speaks intently to woman. Woman responds. Woman watches man leave office. 1960s: Man speaks into telephone. Man with glasses sits behind desk and responds into telephone. Filing cabinet animated word cloud, text design animation. 1974 - A Federal Bureau of Investigation regional office and agents at work in the field and visitors touring the J. Edgar Hoover Building are shown. 1950s: Man pushes filing cabinet through door inside building. Men move furniture through hall. Man sits at desk near window overlooking New York city. New York city. A secretary files a secret file and another intelligence worker talks on the phone, in 1965. The First Motion Picture Unit production office, writing department and camera department are shown, in Culver City, in 1944. A high school student meets with a counselor and they talk about the role of a stenographer, in an office, in 1941.